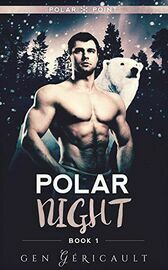 Polar bear shifter Fisher Frost never wanted another sleuth. He certainly never wanted to be anyone's alpha again. Not after the tragedy that befell his family. In Polar Point, he doesn't have to be anything except alive. Wild polar bears have it right: it's better to hunt alone. Alone means safe. Alone means steady. Alone means never losing another piece of himself. Fisher's resolve wavers when the dawn of polar night brings his true mate. Tamsin Norwood's life depends on her getting as far away from Kodiak as possible. Fast. When she brokered a haphazard deal with a bush pilot, she had no idea she'd end up anywhere other than Anchorage. Fate conspires, however, leading her to Arctic Alaska. During the longest, coldest Alaskan nights, Fisher and Tamsin warm to one another. But can she melt this frozen bear? And can they survive the twists and turns fate has prepared for them?